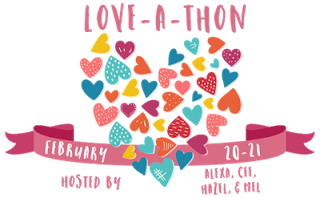 The Love-a-Thon is an annual February event that encourages the bookish online community to spread some positive vibes, strengthen friendships, form new relationships and have fun along the way. I've always enjoyed reading I started reviewing for the Guardian three years ago. After almost a year, I decided that I wanted a place to call entirely my own, and during my tenth grade public exams, I brainstormed over my own book blog! Now, two years ago, here we are! I'm so glad I decided to join this community because it's been an awesome experience! The first thing I did, obviously, was to come up with my name. I decided early on that I wanted have the words "million' and 'books' (duh) in my name, and then, just as something catchy, A Thousand Words, A Million Books came into my head. My initial name was It Was Lovely Reading You, but that was taken, so here we are. I read mostly Young Adult and the occasional New Adult. I have also enjoyed a couple Adult books, but I will forever by a YA girl at heart! Meeting amazing people who I am now so proud to call my friends :D ALSO, BOOKS! And those gorgeous ARC'S. And talking to authors, who have nothing but AMAZING. The ability to fangirl. Seriously. And the amount of people you've never met before who love the same things you do! I binge watch TV, (Grey's Anatomy, Scandal, Arrow, Game of Thrones, The Blacklist, Friends, Gilmore Girls, Castle etc) I LOVE movies, I debate, play the piano, MUN and paint. Sometimes clothes, super cute stationery, bookish merchandise, but mostly BOOKS! I could go on forever. Leigh Bardugo, JK Rowling, Melinda Salisbury, Marissa Meyer, Victoria Aveyard, Victoria Schwab and Kiera Cass. A DARKER SHADE OF MAGIC GO READ IT IT'S SO BEAUTIFUL AND PERF GO GO GOOOOOO!!! YA for finding other Indian bloggers! Even more ya for being South Indian (My parents are from Andhra). Wow! That's kinda stereotypical and a bit rude. That's soo cool how you reviewed for The Guardian! You should go and read ADOSM right now! It's beautiful and amazing! I'm really excited to read Truthwitch too! It's sitting on my bookshelf right now. And I cannot wait TOG5, that's my no 1 most anticipated release for 2016. I finished SoC not long ago so pretty keen for Crooked Kingdom especially after that ending~! The Orphan Queen and the Sin Eater's Daughter are also sitting on my shelf unread and I need to read them this year haha. Ohmygosh ADSOM is wonderful. Waiting for my copy of AGOS in the mail and I NEED IT. It's a drop everything kind of book.